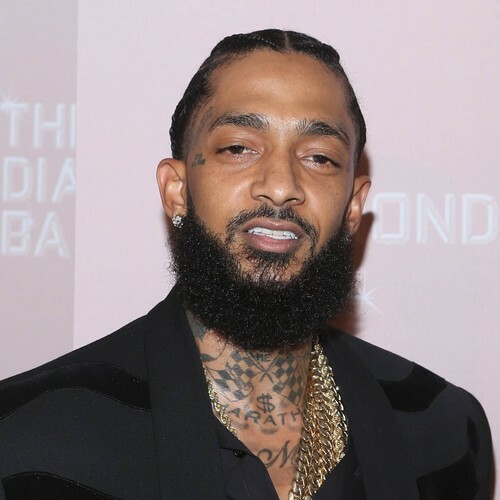 The head of the Los Angeles Police Department (LAPD) has called on the man suspected of killing rapper Nipsey Hussle to surrender to authorities. The Keys 2 the City star was gunned down outside his Marathon Clothing Store in Crenshaw, Los Angeles on Sunday afternoon (31Mar19), and pronounced dead at a nearby hospital. His death has since been ruled a homicide. LAPD officials identified 29-year-old Eric Holder as a suspect in the shooting, and shared the details of vehicle's license plate with the public in an effort to track him down. "Anyone with information related to his whereabouts or this deadly shooting is urged to contact South Bureau Homicide," a representative posted on Twitter late on Monday. On Tuesday, LAPD Chief Michel Moore held a press conference urging Holder to turn himself in, while also telling locals not to provide him with shelter. "To Mr. Holder, who I am confident is watching this... I ask him to surrender," Chief Moore said. "There should be no safe haven for this individual," he added. "This is a man who is of substantial risk to public safety and willing to use violence and we want to see that stop." Police believe Holder shot Hussle in the head and torso, before jumping into a getaway car, a Chevy Cruze, driven by an as-yet-unidentified female accomplice. The vehicle was later abandoned near a shopping mall. Chief Moore also shared the motive is thought to have been personal, and not related to gang violence. "We believe this to be a dispute between Mr. Hussle and Mr. Holder," he said. Hussle, real name Ermias Davidson Asghedom, was just 33.